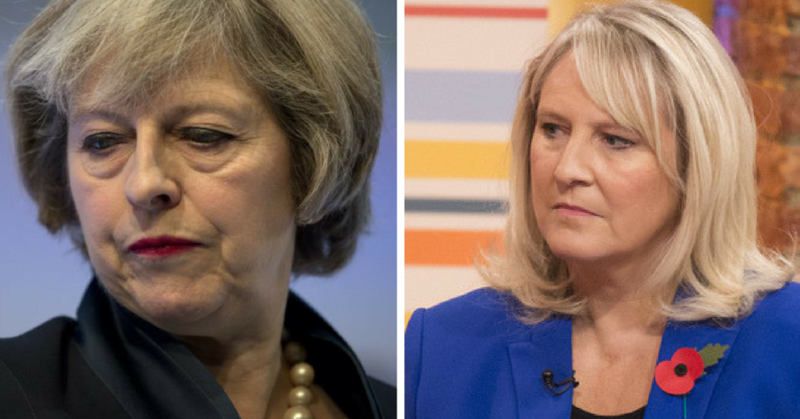 In an extraordinary interview recorded yesterday, a child abuse survivor who served on the Government’s independent inquiry into historic child sexual abuse has claimed she was silenced by Theresa May’s advisors to ensure that Ms May became Prime Minister. And that’s just the tip of the iceberg of Ms Evans’ startling claims about her time serving on the inquiry. Speaking to talkRADIO, Sharon Evans, a former journalist and the founder of Dot Com Children’s Foundation, said that the panel were “promised the child abuse inquiry would be open”, but after a short while she saw that it was ‘so obvious that everything was about the control and suppression of information” and that the supposedly independent inquiry had absolutely “no independence’. Ms Evans claimed that the contracts panel members were made to sign by the Home Office were used to stop them from speaking openly about “very serious allegations about very public figures” – allegations which she says were taken back to the inquiry leaders, but ‘nothing was being done about” them. It became very clear to myself and Graham when we went round to listening meetings, and were being given very serious allegations about very public figures, which we took back to the inquiry and nothing was being done about. Months in, they couldn’t actually tell us how the information was going to be used. I was chairing the panel on one day, and I suggested that we wrote to Theresa May, who was the Home Secretary, to express our concerns. At the end of the day I was taken to one side and it was made clear to me – this is what I was told – that Theresa May was going to be Prime Minister, that this inquiry was going to be part of this, and that if I didn’t toe the line and do as I was told, if I tried to get information out I would be discredited by her advisors. Ms Evans also says that she was gagged by the Home Office during a Parliamentary Committee meeting, describing how she was given a 23 page document detailing exactly “what she may and may not say”. I have got a document, it’s 23 pages. When I appeared in front of the Home Affairs Select Committee – which should be where you openly and honestly answer the questions and challenges of MPs, and where it’s actually an offense not to tell the truth – they (the Home Office) provided me with a 23 page document telling me exactly what I may and may not say. Ms Evans says that she was so alarmed by the nature of the Home Office gagging document that she went to the clerk of the Parliamentary Committee to tell him that she feared she may not be able to tell the truth because of it. I think from what I’ve been hearing that people are already being encouraged to come and give information informally – and this is where we started on the child abuse inquiry – but the thing is it seems like it’s exactly the same. I want to stop them going down the same road where their information is controlled and suppressed, because when there is an inquiry they can control information and decide what is released. This entry was posted in Historic Child Abuse on August 12, 2017 by richardwsymonds37.